If you are looking for a simple recipe, full of flavor, and fancy enough to give as a gift, you have come to the right place! This is one of my all-time favorite snack recipes. As the nuts cool from the oven, they get this candy-like crunch on the outside. The rosemary helps cool off the spicy cayenne pepper. You can adjust the sweet and spice however you like it, and however you make them, you will end up making them again and again! Easy. Healthy. Perfect for sharing. I first started making this recipe 5 or 6 years ago, once my husband and I decided to cut down on our gift giving during the holiday season. I was leaving my full-time job to become a full-time (unpaid) intern on my journey to become a registered dietitian. My husband was planning to leave his full-time job and transition to full-time freelance work. We struggled to figure out how to balance our finances. We loved getting our family and friends gifts for holidays and parties throughout the year. But we just couldn’t keep doing it the same way. So, we decided to swap out store-bought gifts for homemade gifts. Even with using some fancy ingredients, we would still save money on gifts, and we love to share good food with our loved ones. This was one of the first successful homemade gifts I tried. I like to get my nuts and seeds from the bulk bins at my local health food store. It allows me to customize what’s in the mix, and get as much (or as little) as I like. My favorite nuts to include are almonds, walnuts, cashews, and pecans. But I’ve also made this mix with peanuts, pistachios, pumpkin seeds, sesame seeds, and sunflower seeds. It always comes out fantastic! 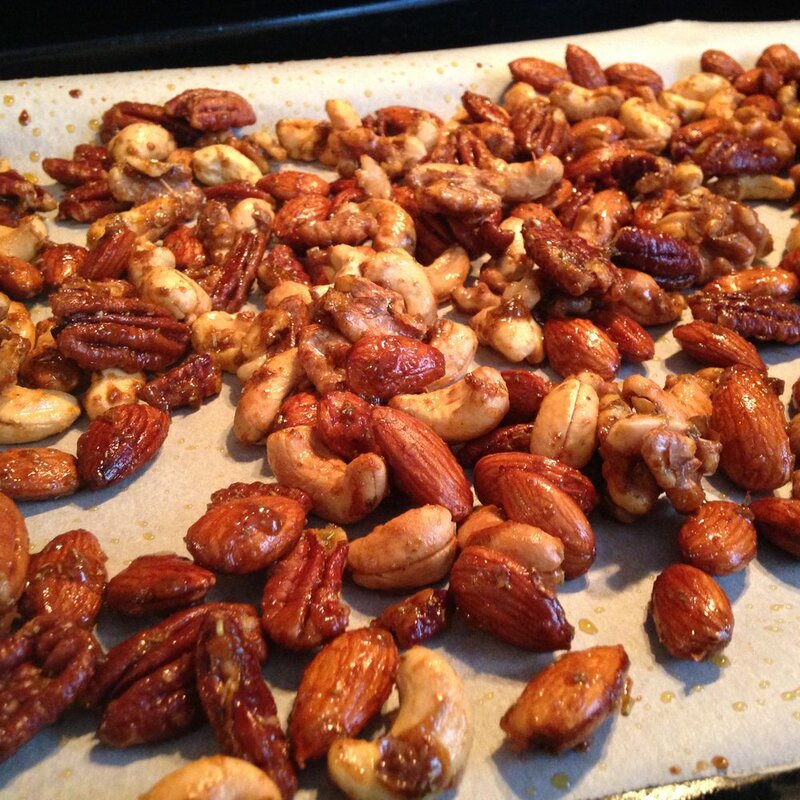 Spread nuts and seeds in an even layer on the baking sheet. Toast in the oven for 10 minutes, stirring once. The nuts should smell toasty and fragrant. Meanwhile, in a large bowl, mix together the remaining ingredients. Add the hot toasted nuts and seeds to the bowl, and toss to coat. Return to the baking sheet, and bake in the oven for another 10-15 minutes, stirring every 5 minutes. The nuts should look very toasted. If you smell burning, remove from the oven.